There are many interesting medicinal plants used in homeopathy. Dulcamara is no exception. The homeopathic remedy comes from the bittersweet plant, which is also called bitter nightshade. Since the time of ancient Rome, bitter nightshade has been used to treat various health conditions. It is particularly useful for skin problems, including allergies, eczema, psoriasis, and herpes. When made into a homeopathic remedy, Dulcamara is also a major skin remedy that is used for warts, itchy skin, hives, and ringworm. It is also considered for diarrhea, hay fever and asthma, head and facial pain, arthritic pain, as well as the common cold, cough, and flu. This article is your guide to everything you need to know about Dulcamara, including its fascinating history, and its various health benefits and uses. Homeopathic Dulcamara comes from the fresh green leaves and stems of the bittersweet plant (Solanum dulcamara). It also goes by the names bitter nightshade, nightshade, woody nightshade, and felonwort. 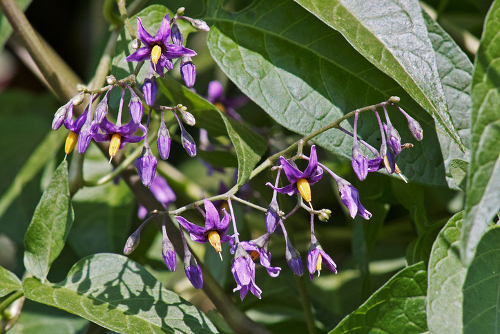 As you might have suspected, the bittersweet plant belongs to the nightshade family (Solanaceae), which also includes foods like tomatoes, potatoes, and eggplant. The bittersweet is a partially woody, herb-like vine that is a perennial plant and moves quickly over other plants. It is native to Asia and Europe. And today, it is considered a weed in North America. Dating back far as ancient Rome, bittersweet was used to treat eczema, psoriasis, cramps, jaundice, rheumatism, pneumonia, absent menstruation, asthma, and phlegm. It was also used for abscesses on the fingertips—also called felons. This inspired one of the names of the bittersweet called felonwort. In the 18th century, Swedish naturist Carolus Linnaeus recommended bittersweet for treating fevers and inflammatory infections. The homeopathic remedy is made from the fresh stems and leaves of the bittersweet. The plant is picked right before it flowers. It is then finely chopped and macerated in alcohol to create the homeopathic Dulcarmara. In 1911, homeopathy founder Dr. Samuel Hahnemann proved the effectiveness of Dulcamara. Dulcamara works well for a variety of skin conditions, and in particular, to treat thick and crusty skin that is also itchy. This is mostly seen on the scalp, which bleeds when scratched. It is also a remedy for treating eczema and ringworm, often found on the scalps of children. The remedy can also treat skin allergies, psoriasis, eczema, and herpes. It is also used for hives brought on from sweating in humid conditions. Hives may be common in the winter from upset stomach and exposure to fog, rain, or cold. Dulcamara is also a key homeopathic remedy used to treat genital warts, as well as large, flat, and smooth warts that are especially found on the palms of the hands. The warts are also present on the face, fingers, back of the hands, and arms. They seem to feel worse from washing with cold water. Research published in Alternative Medicine in 2016 mentions Dulcamara among the recommended constitutional homeopathic remedies used for providing long-term relief from warts. In homeopathy, the remedy profile is significant for determining whether homeopathic Dulcamara is the right fit for you. Belladonna, Hyoscyamus, Capsicum, and Stramonium are similar to Dulcamara. This is because these homeopathic remedies are given to people who are very sensitive to dampness and cold. At the same time, these symptoms are caused by rapid temperature changes or wet, cold weather. The cold may lead even lead to other health conditions, including diarrhea, wheezy coughs, cystitis, and conjunctivitis. The person is also susceptible to respiratory infections that cause thick, yellow mucus. When looking at the symptom picture for Dulcamara, the physical factors outweigh psychological traits. But, there is still some irritability, confusion, impatience, and restlessness. The person may also have a domineering attitude, possibly toward family members. Let’s look at some of the other key health benefits of homeopathic Dulcamara, including how the remedy benefits respiratory infections like the common cold or flu, diarrhea, head and facial pain, hay fever and asthma, and joint and arthritic pain. Dulcamara is a common remedy for coughs due to the common cold and flu, especially during the summer. The person has a sore throat with a thick, yellow discharge from the eyes and nose. Thick mucus may be due to sinusitis, which includes painful pressure and congestion in the head. A stiff neck is also common, along with limb and back pain. There may also be a rattling cough, bronchitis, conjunctivitis, and pneumonia. The cold and flu will also greatly affect the bladder, bowels, eyes, or throat. Walking and warmth will often improve symptoms. Dulcamara is often used for diarrhea that shows up green or yellow, or for loose or slimy stools, while they may even have traces of blood. There may also be pain and nausea before passing a stool. In young children, symptoms may show up during teething. Dulcamara is often needed for nasal congestion with a terrible discharge from the eyes. As a result, there is also constricted breathing. Symptom triggers will often include allergens like grass pollen, dust mites, and animal fur. Pain in a specific part of the head may indicate that Dulcamara is needed. There may also be a sensation of heaviness, confusion, or nausea. Neuralgic face pain may also be present, which may be caused by either sinusitis or Bell’s palsy. Dulcamara is also a key remedy for stiffness and pain in the joints that is often aggravated by cold and damp conditions, such as air conditioning, cellar, or wet weather. Research published in Rheumatology in 2001 indicates that Dulcamara is among the remedies used for rheumatoid arthritis. You can find homeopathic Dulcamara online or in the supplement section of the health food store. It is available in pellet or liquid form. It is also possible to get it from your homeopath when they feel it best matches your emotional, mental, and physical symptoms. As mentioned, homeopathic Dulcamara is mostly used for skin conditions, the cold or flu, diarrhea, hay fever and asthma, head and facial pain, and joint and arthritic pain. It is generally a good idea to visit a qualified homeopath rather than treat your own symptoms. This is because your homeopath will be able to suggest the most appropriate potency and dosage of Dulcamara specifically for you. Follow-up appointments are then a good time for your homeopath to tell you if the potency, dosage, or remedy needs to be changed. Lockie, A., Encyclopedia of Homeopathy: The Definitive Home Reference Guide to Homeopathic Remedies and Treatments for Common Ailments (New York: DK Publishing, Inc., 2000), 62, 194, 226. Lockie, A., et al., The Complete Guide to Homeopathy: The Principles & Practice of Treatment (New York: DK Publishing, 1995), 145, 177. Hershoff, A., N.D., Homeopathic Remedies: A Quick and Easy Guide to Common Disorders and Their Homeopathic Treatments (New York: Penguin Putnam Inc., 1999), 105, 185, 194-195, 286-287. “Dulcamara,” Herbs2000; http://www.herbs2000.com/homeopathy/dulcamara.htm, last accessed August 24, 2017. “Dulcamara,” Home Remedy Central; http://www.homeremedycentral.com/en/homeopathic-remedies/homeopathy/dulcamara.html, last accessed August 24, 2017. Fisher, P., et al., “A randomized controlled trial of homeopathy in rheumatoid arthritis,” Rheumatology, September 1, 2001; 40(9): 1052-1055. DOI: 10.1093/rheumatology/40.9.1052. Mahendra Oza, P., “Homeopathic management of warts,” Alternative Medicine, June 15, 2016; 2(1): 45-47. DOI: 10.4103/2455-3972.184085. Abdollahifard, S., “Homeopathy for Treatment of Herpes Simplex Virus,” The European Society of Contraception and Reproductive Health, May 4, 2016; https://esc.multilearning.com/esc/2016/14th/127035/sareh.abdollahifard.homeopathy.for.treatment.of.herpes.simplex.virus.html?f=m1.